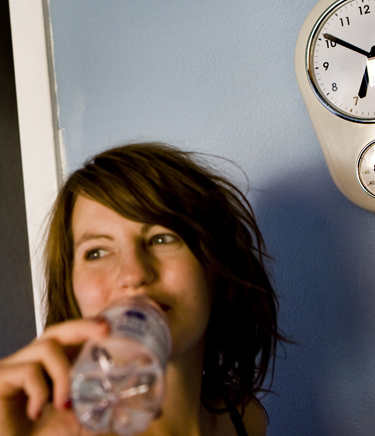 2012 is now in full swing, and we hope it'll only bring the best for you! We think we can give this new year a bigger theme. For us, it'll be the year of free speech in documentary. This is not just about our own films. It happens quite often that corporate control freaks threaten independent documentary filmmakers and their livelihoods. Or as Dole's PR company said it: "It is easier to cope with a bad conscience than a bad reputation." Here's another example, an article published this weekend in the NY Times about what happened to Joe Berlinger who had made a film about Chevron's mess in Ecuador. With the Sundance Film Festival, we're lucky enough to have the greatest possible launch platform for BIG BOYS GONE BANANAS!*. What we don’t have is the money to pay for the initial costs of such a launch. We’re still suffering from the loss of all the time and money that went into the fight Dole had brought upon us. Against all odds, we did succeed in making my previous film available to people around the world. But this came at a huge price. An email from Caroline Libresco made my heart beat. 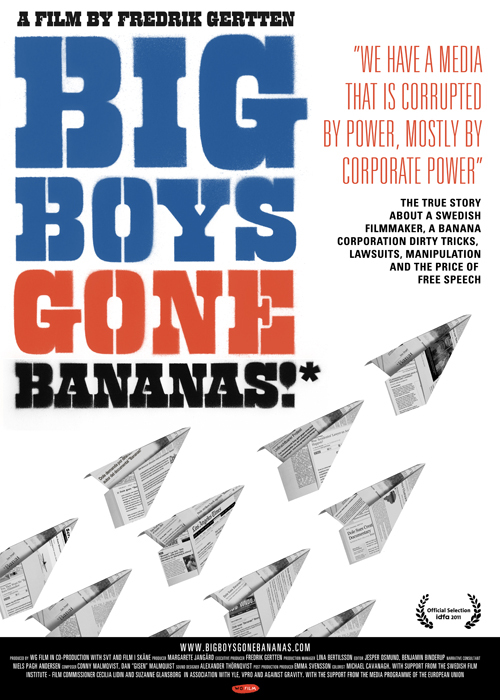 On behalf of John Cooper, Director of the Sundance Film Festival, it’s our great pleasure to invite BIG BOYS GONE BANANAS! * to play in our World Cinema Documentary Competition at the 2012 Sundance Film Festival. Our programming team is very excited to present the North American premiere of this excellent film. One email can sometimes change a lot of things. This one was then followed by a flood of emails from film festivals, sales agents, distributors, journalists – and of course friends wishing us all the best. After the last screening at IDFA Film Festival on 27 November, Fredrik Gertten attended a special Question & Answer session at the Tuschinski cinema. 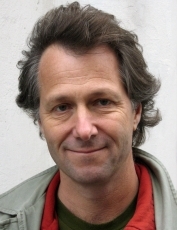 Moderator was the well-known VPRO journalist Teun van de Keuken. Thanks a million to photographer Frank Verburg who filmed it all. Enjoy! Big Boys Gone Bananas! * makes for gripping viewing and you can only admire the stance taken by Gertten and Jangard as they refuse to bend to pressure. 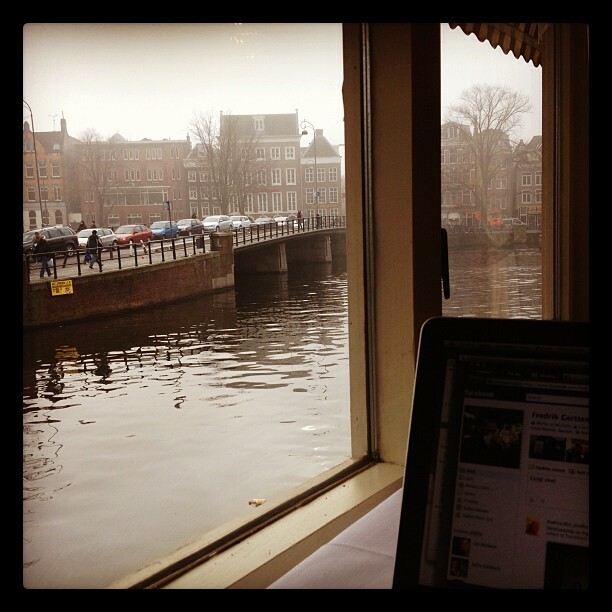 Blogging by the canal. White swans on black water. Trying to get my head around the intense day I lived yesterday. Including the jampacked festival bars of this great festival city. IDFA, Amsterdam is an amazing place to meet friends and collegues from all over the world. Saturday morning I gave the opening speech at the International Fair Trade Towns Conference in my hometown of Malmö. Good people from 23 countries fighting for a good cause. Really inspiring. If you have the time, listen to my speech here from minute 44. After the conference I jumped on my bike and had a coffee with my sweet daugther. A few hours later, I met up with my producer Margarete Jangård and went to Amsterdam. Straight to a press conference where Morgan Spurlock and friends announced the new Cinelan short film project, where I have also been invited to do a 3-minute short. Really cool. We'll fix it in post! Emma here, post-production supervisor on BIG BOYS GONE BANANAS!*. With just one day left in post-production I should be panicking. A bit worrying that I'm not, but I'd like to think that everything is going according to schedule! So I will spend my free time informing everyone interested about the post production process, or rather, "The making of BIG BOYS GONE BANANAS!*". A half-rotten banana on my head? Nine days to the world premiere and the site is up! It might look like one small step to be launching an outreach website, but for us this is a giant leap. We now look forward to a more direct connection with our friends and audience. This is certainly needed in a world where the Hollywood studio films consume almost every screen in theatres around the world. We know that documentary film is a broad and loved genre, we have audience. Now we need your help, sharing the trailer, signing up for volonteer work. We also need your opinions and experience of corporations attacking their critics, shooting the messengers. The true story about a Swedish filmmaker and a banana corporation. Dirty tricks, lawsuits, manipulation, and the price of free speech. Do you want to be part of our journey? Sign up and keep up with this film!